Columbia University Press, 9780231173148, 544pp. Jeffrey D. Sachs is one of the world's most perceptive and original analysts of global development. In this major new work he presents a compelling and practical framework for how global citizens can use a holistic way forward to address the seemingly intractable worldwide problems of persistent extreme poverty, environmental degradation, and political-economic injustice: sustainable development. Sachs offers readers, students, activists, environmentalists, and policy makers the tools, metrics, and practical pathways they need to achieve Sustainable Development Goals. Far more than a rhetorical exercise, this book is designed to inform, inspire, and spur action. 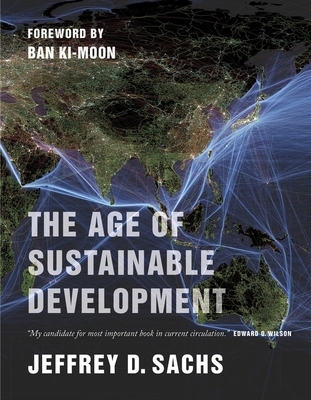 Based on Sachs's twelve years as director of the Earth Institute at Columbia University, his thirteen years advising the United Nations secretary-general on the Millennium Development Goals, and his recent presentation of these ideas in a popular online course, The Age of Sustainable Development is a landmark publication and clarion call for all who care about our planet and global justice. Visit http: //cup.columbia.edu/extras/supplement/sachs-9780231173148 for additional teaching materials for students and instructors, including chapter summaries, key concepts, problem sets, and slides. Jeffrey D. Sachs is a world-renowned economics professor, leader in sustainable development, senior UN advisor, best-selling author, and syndicated columnist. He serves as the director of the Earth Institute, Quetelet Professor of Sustainable Development, and professor of health policy and management at Columbia University. He is special advisor to Secretary-General Ban Ki-moon of the United Nations on the Millennium Development Goals, and he held the same position under Secretary-General Kofi Annan. He is director of the UN Sustainable Development Solutions Network as well as cofounder and director of the Millennium Villages Project. He has authored three New York Times best-sellers in the past seven years: The End of Poverty; Common Wealth: Economics for a Crowded Planet; and The Price of Civilization. His most recent book is To Move the World: JFK's Quest for Peace. Ban Ki-moon is the secretary-general of the United Nations, an office he assumed in 2007. He was previously the foreign minister of the Republic of Korea.